When Alice Waters opened Chez Panisse in Berkeley in 1971, she wasn't trying to start a food revolution. Here's how her neighborhood restaurant became the epicenter of the organic movement. 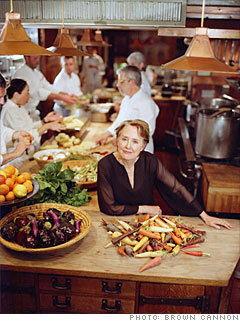 Alice Waters never ate in a restaurant until she went to France in her junior year of college. "That's when my whole world opened up," she recalls. "Everything was so beautiful there. I even remember my first French meal: a brothy root-vegetable soup with lots of parsley and garlic. It was amazing." After graduating from the University of California at Berkeley, Waters became a teacher at a local Montessori school. She loved the philosophy -- Montessori is "all about educating the senses and learning by doing" -- but decided she wasn't a very good teacher. "My students -- four-year-olds -- wanted to know everything, and I felt I didn't have the answers," she says. "So I quit and opened a restaurant, borrowing cash from my father, who mortgaged his house."